G.A.B bagged a gold and silver at the recent Putra Brand Awards and Heineken was inducted into the Putra Brand Icon hall of fame. 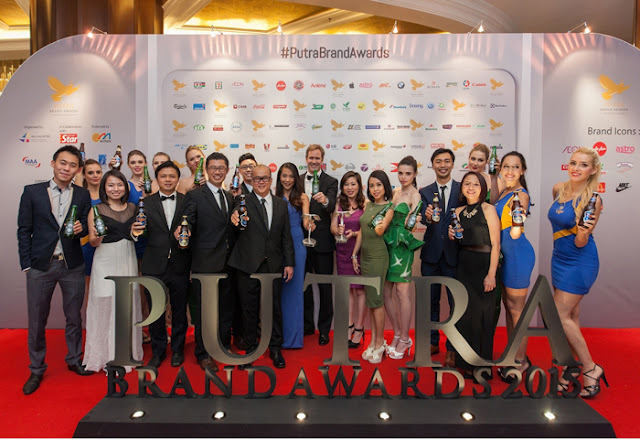 Kuala Lumpur, 26 August 2015 – It was a night of celebration for Guinness Anchor Berhad (GAB) as the brewery took home three awards at the Putra Brand Awards held at Majestic Hotel. Heineken received a gold, and Tiger Beer garnered a silver in the Beverage-Alcoholic category, bringing GAB’s total tally from the prestigious awards ceremony to 18 wins over six years. To further solidify GAB’s victory, Heineken was inducted into the Putra Brand Icon Hall of Fame for winning its fourth consecutive gold award. It was a roaring success for Tiger Beer, the brand won the silver award in the ‘Beverage-Alcoholic’ category at the Putra Brand Awards 2015. “We are honoured to receive the silver award, as this recognition is truly a testament to the quality of work we’ve been doing over the years. To further solidify our position as one of the leading beer brand in Malaysia, we recognise the importance to constantly innovate to excite your consumers. Tiger Radler represents yet another innovative way of how we keep the Tiger Beer brand refreshing for our discerning drinkers,” said Jessie Chuah, Marketing Manager for Tiger Beer. While Tiger FC marked its 11th year of uniting real fans across Malaysia through its various Big Away Game viewing parties, Tiger Translate returned bolder and edgier the second time around. The event, which debuted last year, has already established itself globally as an arena that features unconventional collaborations of art and music. The adaptation here is no different as Tiger Translate continues to showcase creative “East meets West” efforts by local and international artists. Newly launched Tiger Bites campaign which challenges foodies to uncage the secret street food havens throughout Malaysia. Malaysians can participate in the campaign by creating a trail for others to follow as they uncover hidden food gems via www.tigerbites.com.my. All they have to do is to sign up and start dropping pins along their way. Their efforts will be rewarded as exciting prizes await those that participate in this seven-week long contest. The excitement does not end there. In celebration of this new campaign and to all that have generously shared their pins, Tiger Bites will throw an exclusive festival filled with the finest street food with ice cold Tiger Beers as accompaniment.